Became synchronous, if standby will fall. At least two nodes in cluster work synchronously at any time. 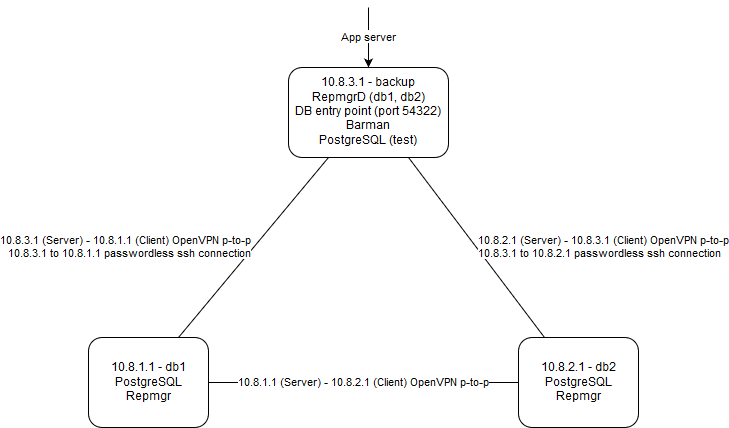 First, add necessary repos and install PostgreSQL on all servers. Change password for postgres user on db1 and db2 servers. We will need it in Part 3. Second, add 2ndQuadrant(repmgr and barman maintainer) repos on all servers. Now, install following utils on all servers. barman-cli is a set of scripts helping us to archive and retrieve WALs from barman remotely and safely. Install barman on backup server. Change password for barman user on backup server. We will need it in Part 4. To keep our replication and backup processes safe, we need to join our servers together using secure connection. You are probably no need it, if all of your servers already joined using secure data center’s local network. However, I’m not recommending you to keep all eggs in one basket. Anyway, just keep in mind you should replace following IPs with your ones anywhere you will see them. OK, let’s join our servers using simple point-to-point OpenVPN connection. First, install OpenVPN binaries and generate server key. Second, copy server key to client remotely. From db1 to db2 server. From db2 to backup server. From backup to db1 server. Next, create server and client configs. Reload configs and restart OpenVPN. Excellent! Now we are ready to setup replication via repmgr.